Location: Florence Events Center, 715 Quince St. Description: Warm your heart and soul with the best in folk, bluegrass, Americana, and more. 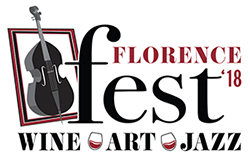 Three days and a dozen acts at the Florence Events Center. The event showcases a variety of international touring talent and Pacific Northwest favorites, an artisan fair with 2-D and 3-D pieces by top-flight artisans, a wealth of locally-sourced cuisine and fine libations, lively jam sessions, pie sale, and a Thursday Kids Concert for local school districts. Description: Celebrate success in commerce and community leadership! This prestigious banquet recognizes excellence in the local business community by naming recipients for awards in Excellence in Customer Service, Curb Appeal, Non-Profit Achievement, Community Caring, Innovation in Business, and the Stu Johnston Business of the Year Award. The event includes the State of the Chamber address. Two outstanding individuals in the community will be honored with the Future First Citizen Award and the First Citizen Award recognizing leadership and impactful selfless service to the community. The Chamber will also recognize with the Distinguished Service Award an individual or business that has selflessly given of their time and efforts in supporting the Chamber. Valentine’s Day? Yes! Check with our local lodgings to learn about romance packages. Description: Volunteer “Whale Watching Spoken Here” experts are strategically located along the Oregon Coast to help you spot some of these 20,000 majestic, migrating mammals. Plan now to enjoy Spring Break in Florence! 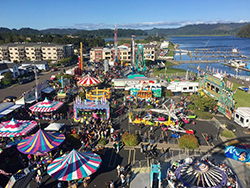 Description: Entrants have their families join them here on the Oregon Coast for a great Mother’s Day weekend event. The race begins with the swim course in beautiful Woahink Lake. The bicycle course traverses the winding backroads with challenging inclines found in the rural Oregon coastal forests. The running course culminates at the top of one of Oregon’s unique sand dunes in the Oregon Dunes National Recreation Area. Description: Come enjoy the pageantry of the second-longest running floral festival in Oregon! Festivities include Saturday’s kids’ parade, Sunday’s grand floral parade, a flower show at the Florence Events Center with hundreds of our famous rhododendrons, the Davis Shows carnival, classic car shows and cruise, motorcycle shows, 5K run, food and drink, street vendor fair, and the coronation of Queen Rhododendra, King of the Coast, and their Court. Description: Join the Chamber as we review the previous fiscal year and look forward to the next. We will have a special celebration for retiring outgoing board members and the installation of new board members and officers. Enjoy music, networking, prize drawings, and delicious bites and beverages. The Chamber welcomes the Florence community to this adult-only event. Location: Florence Municipal Airport, 2000 Kingwood St. 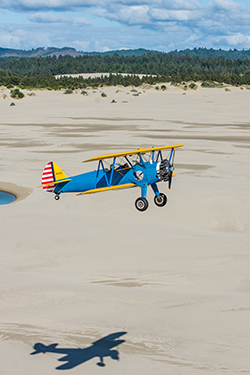 Description: This is one of the most entertaining classic car and airplane shows in Oregon. In addition to 100 really cool cars, there are many antique and hot rod airplanes… plus military, police and fire displays. It is a full day of exhibition action, food, live music, and more than 20 local and regional groups with displays and activities for the whole family. 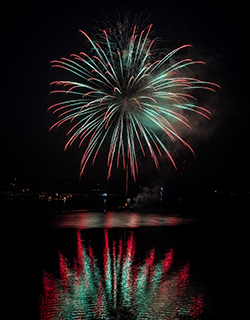 Description: Old-fashioned family fun and games, pie- and watermelon-eating contests, food, music, and one of the best fireworks shows on the coast launched from a barge in the Siuslaw River to add a dramatic reflection off the water. Add synchronized patriotic music and you’ve got yourself a show to remember! Description: Florence will be in top gear and revved-up for you during the Annual Rods ‘N Rhodies Invitational Car Show. 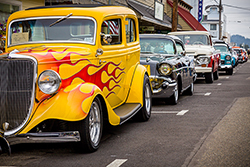 Because Rods ‘N Rhodies is an invitational, you know you’ll see more than 100 of the West Coast’s most gorgeous, amazing, awe-inspiring high-end hot rods and custom cruisers from 1976 and earlier at different venues all weekend. Themed music, cruise, food, and surprise performances on a closed-off Bay St. Description: Let the bargain hunting begin! With scores of residential and commercial sales all around town, you’ll enjoy a shopping adventure like none other. Snag a copy of the garage sale guide at the Siuslaw News office (148 Maple St.), online at TheSiuslawNews.com, or the Chamber of Commerce office (290 Highway 101) and enjoy your treasure hunt! Description: Racers and their fans enjoy views of the Siuslaw River, four aid stations with water, gu energy gels, electrolyte beverages, snacks, and toilets. All finishers receive a medallion and an additional medallion is awarded to the top three in each age group of five-year increments. Participants enjoy post-race refreshments and chip timing by Eclectic Edge Racing. 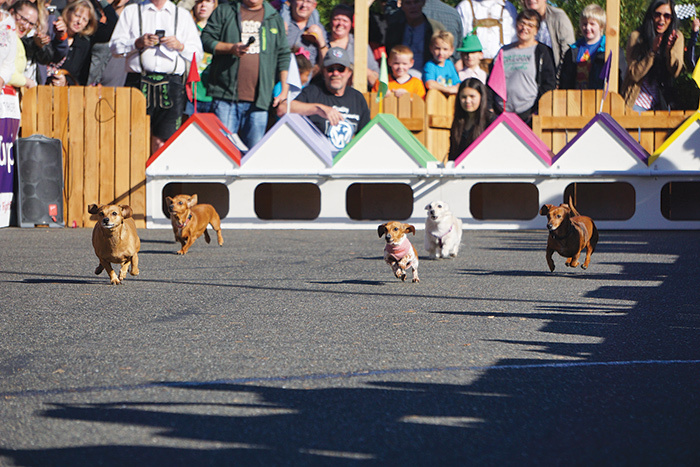 Racers fly in from around the country for this event, as it is a destination event in Lane County and sees participants from eight states, as far east as Massachusetts. Description: Join us for this fun filled three day weekend in Florence! Friday, Saturday, and Sunday search for and enter to win hidden glass floats around town. On Saturday stroll through Old Town and sample wines from a dozen of Oregon’s finest wineries. On Sunday be your own judge and let us know which is your favorite chowder from the dozen different samples available all along Bay Street. Glass Float Hunt & Chowder Trail passports ($5 each) are available Friday at the Visitors Center (290 Hwy 101) and in Old Town at Gazebo Park Saturday and Sunday. Commemorative Wine Trail glasses and tasting tickets will be on sale at Gazebo Park in Old Town Saturday. Glasses are $5 and tickets are $1 each. Live music, surprise performances, and more. 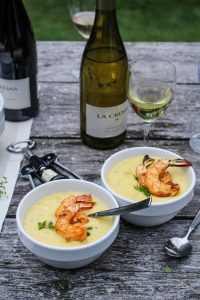 Register for wine pairing dinners, clam digging clinics, and other events! Description: Exciting, hilarious family fun along with Oktoberfest-themed music, food, and drink. Location: Parade route begins at Florence Events Center, 715 Quince St., and wends its way through Historic Old Town, to Veterans’ Memorial Park (Bay St. at Kingwood St). Description: This annual event brings honor to those who served our country through their military service. When: Saturday afternoon/evening after Thanksgiving. Description: Enjoy live music, warm beverages, Santa’s arrival, great holiday season sales, hayrides, caroling, and the Mayor’s Tree Lighting Celebration. Coincides with national Small Business Saturday to encourage shopping at local small businesses all around town. Description: Bring and decorate your boat for a festive time at the. All floatables from kayaks to superyachts are welcome!